Big news from 3 months ago...we got engaged! In a beautiful historic park. Other big news...we moved! To a beautiful historic home facing said historic park. So naturally, I wanted to begin a little herb garden. And what do herb gardens need, but pots. "Flower pot" is one of my favorite search terms on Pinterest. 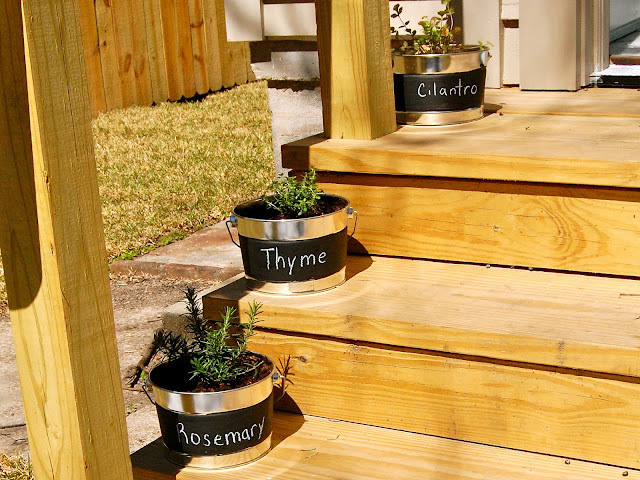 I've been particularly enamored with chalkboard pots - so the name of each herb can be scrawled on front. I found these little metal buckets at Home Depot and painted a thick band around the middle. For whatever reason, the only chalk available was giant sized children's sidewalk chalk, so I couldn't quite scrawl - had to go with more of a neat print. Now I just move the pots around, still figuring out where I think they look the cutest. My second flower pot project (also a Pinterest find) involved a couple of fat quarters of fabric and Mod Podge. So far I've covered a 2-inch pot and a 4-inch pot. I ended up wasting quite a bit of fabric as I wrapped the pots, so I'm working on a pattern for both sizes before I wrap the rest. I've been keeping cards and papers I need for wedding planning in the bigger pot. I'm thinking about a candle for the smaller pot. For now, they are a great alternative center piece for our new dining room table!